The Bridge is not a new game. It’s about two years old, and we first played it on Steam – where we instantly liked it. Now it’s come to the Vita, and in some ways… we like it even better. Here’s why, in our review. The game content in the Vita version is exactly the same. 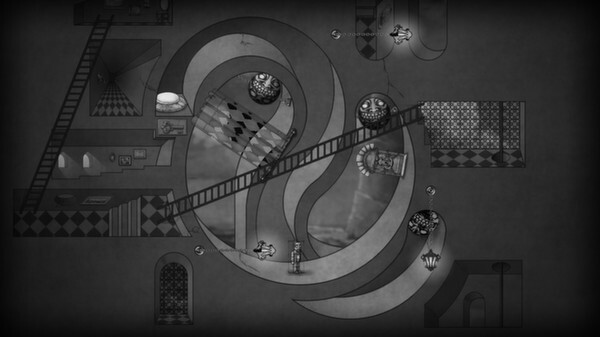 The game offers you a range of physics-based puzzles divided between four chapters that each have six levels in them. Some will only take you a minute or so to complete, but some of the later ones will have you scratching your head for ten to twenty minutes if the solution doesn’t come to you right away. After you go through the levels, you also get to play them again in a mirrored mode. The key to each of these puzzles is a combination of ‘impossible constructions’ (as famously pioneered by Escher) and the rotation of your screen which allows you to manipulate your own position within the level. In addition to this mechanic making it possible to walk on ceilings and walls, it also allows you to flip switches using either your own body weight or that of a ball-shaped enemy. Touching said enemy will cause immediate death, but you always have the option to rewind time and fix your mistake. To aid you in your manipulation of gravity and objects, you can sometimes utilize a vortex to catch you and/or an enemy – allowing you to stay in place while the world around you rotates. If there’s no (reachable) switch to turn off the vortex then there’s no way out though, so be careful. The puzzle mechanic is great, but the game’s art style is the real star here. The game looks as wonderful as it did two years ago, and hasn’t lost any of its shine in the transition to Vita. Every single character and level looks pencil-drawn in a black and white style that resembles that of a sketchbook come to life. Combined with the always striking Escher-like backdrops this makes for a unique and creative puzzler. The game is rather short, and two or three levels can be somewhat frustrating because the way out can be easily overlooked – because it doesn’t just rely on the right solution but also on pixel-perfect positioning. Still – the game format works really well for handheld systems, as individual levels are perfect for playing ‘on the go’ in terms of their length. What makes the Vita an especially nice platform for The Bridge is the importance of rotating your screen in order to solve its riddles. This is normally done using the trigger buttons, but the Vita allows you to also use the handheld’s own tilting feature – making for an immersive and fun way to control the game. If you never played this game before, and you enjoy games like Braid – be sure to pick this one up. It’s a highly creative puzzler with a wonderful art style that we can only recommend.